My youngest daughter – Tess – is heartbreakingly and very worryingly beautiful. She has long blonde hair, and extraordinarily long legs, which as you can see, she inherited from her mother. Last year she turned 16 and a few weeks before her birthday, she came to me and announced she would like to hold a party. She was clearly expecting this response. “What’s the main reason why not?” She asked. “Ok…” she said thoughtfully… and buried herself in iPad land for a while. When she came back, it was to show me something she’d found on Amazon. It was a huge black sheet of plastic, the kind we use for a damp proof membrane. “Well there isn’t just the carpet to consider…” I said. “What else is there?” She asked expectantly. I was sure if wracked my brains I’d find another good reason why not to have this party… I just needed some time…. So Tess had her party. The carpet was fine, the stairs police did their job well, and the neighbours were happy. Tess and her friends even cleaned up before going to bed, so it was nice and tidy for me to get up to the following morning. In planning her party, Tess had been audacious, tenacious, and absolutely determined not to take no for an answer. I recognise these traits. I started my business as a single mum with 3 kids under 10. I too had had to be audacious, tenacious, and absolutely determined not to take no for an answer…..
You get the daughter you deserve….. I was invited to join a mastermind membership club recently. The fee was a significant investment but the benefit to my business would be huge. I admit I was dithering over the decision, and Kevin – the leader of the group – told me “Sam, I like to work with people who are action takers. If you’re not ready to take swift and decisive action, then perhaps you’re not ready for this group. “So when you give them the market appraisal and explain your fee, what do they say?” I asked. “They always say, ‘I’ll think about it’,” and then I don’t hear from them again. “That sounds just what I need!” said Donald. I told him the price, he said that was within budget. I told him my availability, which suited him. “So would you like to go ahead?” I asked. “I’ll think about it”, said Donald. 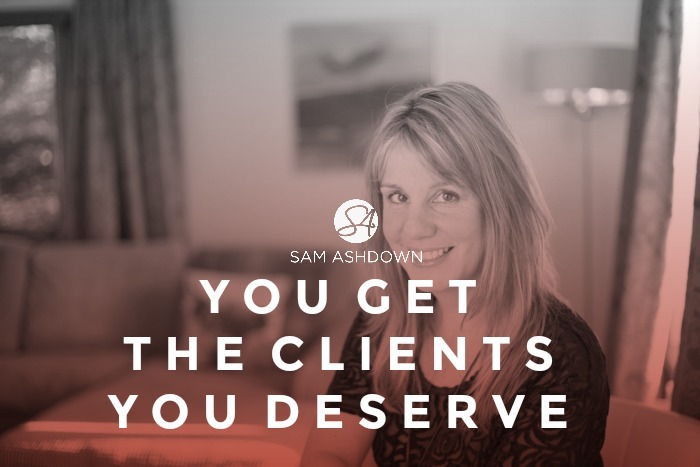 You get the clients you deserve. We want clients who take swift and decisive action, be appreciative of our efforts, forgiving of our errors, and who actually value and follow our advice. We need them to communicate clearly any concerns to us and pay us gladly and promptly when the time comes. But in order for us to attract clients like that, we have to be that kind of client ourselves. So the next time you get a bill, pay it as quickly as you can. And do it gladly, in appreciation of the value it has brought to you. Your clients will do likewise. If you’re experiencing a problem with a service, communicate your concerns to the suppliers clearly. Your clients will do the same for you. Agents tell me frequently that their clients don’t listen to advice, that they ask for their input, but then they don’t follow it. These are the same agents that ask for my advice on how to increase their social media following, or improve their website, or create more valuation appointments…. then ignore my advice and carry on doing exactly what they’ve always done. “But I’ve been really busy with this new launch, and training, and a ton of travelling….” I tailed off. “Ok, I get it.” I said. And I did. In order to attract clients who are contactable, and available for a phone conversation, I too have to be that person. You get the clients you deserve because you teach them how to treat you. To get great clients, you have to BE a great client. Eagles don’t hang out with pigeons. If you want to attract eagles, you have to be an eagle. You’re not asking someone to pay for a transaction; you’re asking someone to invest in advice. Possibly the best property selling advice they have ever received in their lives. You’re asking them to put faith, energy and money into the advice you give. But when was the last time you invested in advice? When was the last time you invested time, effort or money in yourself? Then why should they? If you don’t believe in self-investment, your clients will only ever see your service as a commodity, and they will only pay a transactional fee for that. You don’t see any fat fitness coaches, do you? They wear the proof of their self-investment all the time. If you saw anoverweight, unhealthy fitness coach, would you pay for him to be your coach? How much faith would you have in his ability to get you off your comfy couch and out running in the rain? People are a great mirror. There are many,many agents out there who want to attract great clients, but it’s a little too comfy on that couch. Want clients to get off the couch and sell their house? Get off the couch yourself. Want clients who take action? Be an action taker. Want clients who will recommend you to their friends? Be always on the lookout for ways in which you can give valuable referrals. Want clients who will trust your expertise and follow your advice? Get a coach! Then you’ll really understand that client-adviser commitment, how it works and what both parties have got to put into it to make it a really valuable relationship. If you want clients who love the whole business of selling their home and moving on, then you have to, too. See the process as an exciting adventure and your enthusiasm will be catching. I know agents who are lazy, bitter, dishonest and think that the world owes them a living. I bet you do too. Guess what kind of clients they attract? Inflate, don’t deflate. Emotions are contagious. I have a lovely client, let’s call him Rupert. He’s a real teddy bear. 50 going on 90. He wears short-sleeved check shirts with hand-knitted tank tops and tweed ties. He has a gentle manner and apologises a lot. Old ladies absolutely love him. That’s why he gets all the retirement properties and probate cases in his area. But these types of properties don’t bring him enough business to ever be able to retire. At the time we were talking, he only had 6 properties for sale, all of them bungalows. “What kind of properties do you want Rupert?” I asked him. It seemed that the lovely Rupert with his handknitted tank tops wasn’t the agent of choice around the yummy mummies in the town. But he was the only valuer in the office, so what could he do? Rupert had a lovely lady in the office called Karen, who was his admin assistant. Karen is a very attractive lady in her early thirties with two primary school children. She works school hours so she can pick her kids up. She’s friendly, enthusiastic and knows every single school gate mum in the town. I put in a proposal to him to train Karen in how to do a market-appraisal, not Ruper-style, but yummy-mummy-style. The last I heard, Karen had left to join another agency in the town that recognised her ability to sell to yummy mummies. And Rupert still only has 6 properties for sale. And they’re all bungalows.